With the modernisation of Electronic Health records, many government healthcare agencies are trying to integrate medical information from multiple sources. With Qlik, these agencies can consolidate data from across source systems in a single view that aggregates patient information and helps them to quickly identify a path of care. More than 1,000 healthcare providers spanning hospitals, nursing and residential care facilities, and ambulatory services worldwide use to QlikView to overcome Business Discovery challenges and build a true clinical decision support system. 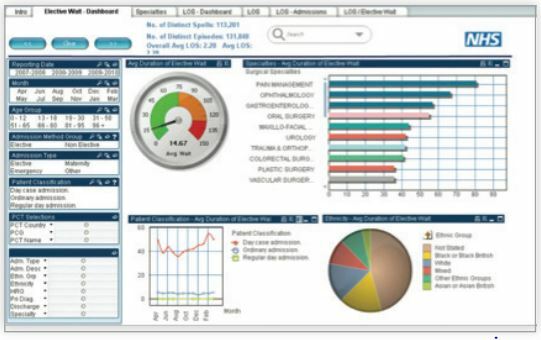 In the UK, QlikView is used by more than 162 NHS Trusts to analyse and report on data from multiple critical systems. It empowers non-technical users to get the answers they need to be more productive, more efficient and more effective, and promotes total visibility across all functions and departments, saving time and money in all areas. QlikView substantially aids clinicians and managers with their day-to-day tasks by providing reliable, up-to-date information on a range of metrics. 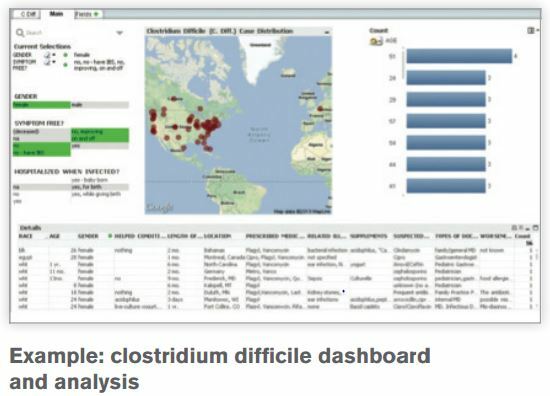 Drawing information from disparate sources and presenting it on-screen for real-time analysis, QlikView applications allow users to drill down to individual patient level for a clear and detailed view of performance. The multi-layered security model allows access to be restricted by rank, role or department, maintaining absolute patient data confidentiality while ensuring that everyone has access to the information that supports their function. The result?.. Patterns and trends can be seen at a glance. Problems can be flagged early. QlikView compels users to take action by arming them with the facts. Trusts like Cambridge University Hospitals, Newham University Hospital and Liverpool Heart and Chest Hospital are all benefiting from improved clinical reporting and dashboards thanks to QlikView. QlikView is indispensable as a tool for pulling disparate data together to create fast, accurate reports that demonstrate a single version of the truth. It delivers valuable and dramatic insights into general financial performance, profit and loss improvements, patient level costing / service line reporting and suppliers all from one platform, and in minutes, not days. QlikView builds executive dashboards from transaction level data so users can go from high level costs to individual line item detail in seconds. This ability to truly understand what makes up the high level numbers enables the right decisions to be made more quickly and with more certainty than ever before. The North West NHS Collaborative Procurement Hub deployed QlikView to consolidate data from 45 financial and purchasing systems a project which took less than 12 weeks to implement. QlikView has since delivered procurement cost savings of £42 million and freed up hundreds of hours previously spent on manual reporting and analysis. You too can expect ROI in a matter of weeks. Using QlikView, government healthcare providers are reducing the length of patient stays, holding down costs, and reducing re-admissions. Researchers are improving the quality of clinical trials by drilling more deeply into electronic records and spotting anomalies. And, providers are making better, more objective decisions faster using a larger evidence base, driving improved performance and care delivery and saving more lives.